A customer experience map is relatively easy for teams to complete together in an hour or two, even without a resident UX expert. It is widely regarded that design is a team sport, best approached by everyone regardless of their perceived “creativity”. As with most planning and UX exercises, the understanding and consensus generated during the process can often be more rewarding than the result. Completing the exercise quickly, in a team setting, also maximises your return on investment, as experience maps can often become elaborate and complex documents. Gather your team and agree on a key customer journey to illustrate as a linear process, let’s say the “purchase journey”. In the first half of your workshop, discuss the key themes that customers must pass through. These might be research, educate, decide, purchase and evaluate. 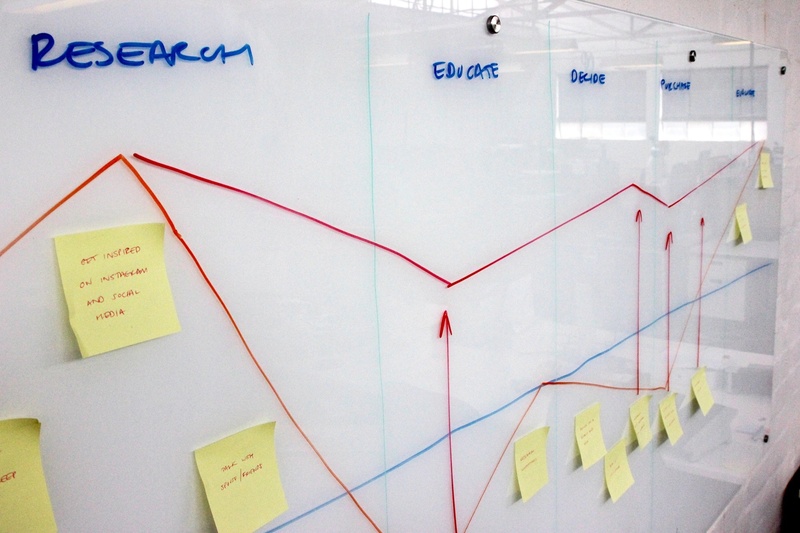 For each theme, add a post-it note for each major step or action and place it vertically on the whiteboard according to the current customer satisfaction levels, from minus 5 (extreme dissatisfaction) to plus 5 (extreme satisfaction). Once documented, spend the second half of the workshop discussing the largest gaps in the experience. How satisfying do we want each touchpoint to be? Where are our competition outdoing us? What are our customer’s expectations? As a team, you can draw this new line of desired customer satisfaction across each touchpoint. The gaps between your current experience and your desired level represent your opportunity. The brilliant UX evangelist Jared Spool first wrote about using the Kano Model to deliver a superior customer experience way back in 2011. The Kano model shows how investing in customer expectations will only eliminate frustration, while improving performance by reducing load times or optimising ease of use can begin to provide customer delight. The more exciting and forward thinking features have the power to surprise and delight your customer and affect their overall customer experience. By categorising your identified opportunities, ideas and hypotheses from your customer experience map into basic expectations, performance enhancers and excitement generators, you can quickly identify and agree on the ideas that will generate the highest customer impact for the least effort. We have found customer experience mapping to be so efficient and powerful that we now use it to track our own clients’ experience of engaging with us. It’s important to not only select practices which work for your working relationships, but also can be translated to your own business too. We can now identify gaps in our own clients’ experience of work with us, which will help us continuously improve our services for the future.